RUSH: What’s happening in the NFL is getting harder and harder to… Well, no. It’s getting easier and easier to explain. It’s just tougher and tougher to say it. Did you see what happened in Jacksonville yesterday between the Jaguars and the Seahawks? Well, yeah, essentially it was a gang. What happened was — do you know what victory formation is? It’s when the quarterback takes a knee at the end of the game to run out the clock. That’s the victory formation. And the snap of the ball, the quarterback takes a knee, takes place in one second or less. Defensive linemen for the Seattle Seahawks, Michael Bennett — it was the Jacksonville Jaguars taking a knee, they had the game won, they were in victory formation just running out the clock. You don’t run a play, no sense in anybody getting hurt, the game’s over, there’s nothing anybody can do. 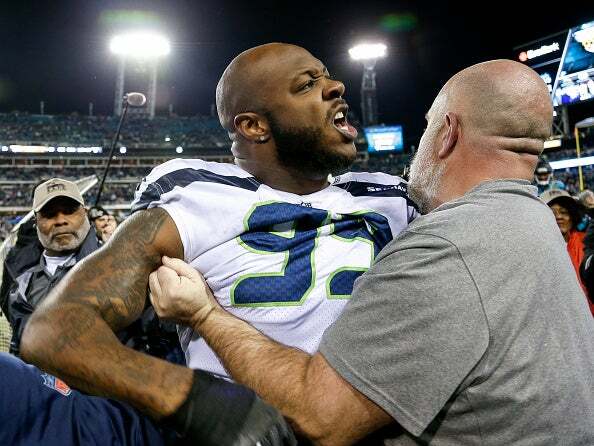 Michael Bennett, who, by the way, has been nominated as the Seahawks candidate for the Walter Payton Man of the Year. Michael Bennett, this is the guy who ran from law enforcement when a casino was being shot up in Las Vegas. This guy led the league in following Kaepernick in not standing for the national anthem. His brother Martellus Bennett played for the Packers this year and the Patriots, and he’s a tight end. Anyway, he made a move right for an offensive lineman’s legs. He could have broken a leg or taking the guy out via a knee injury. Well, this caused all kinds of stuff to happen. Fights broke out and two players were ejected from the game in the last 51 seconds. One of the players was from the Seahawks and he’s walking off the field — remember there’s less than a minute to go — and the classy fans of the Jacksonville Jaguars, somebody threw a beer on the guy. And rather than just keep walking, he stopped and started shouting, “You don’t disrespect me. You don’t disrespect me.” And he made a move, he tried to get into the stands. He wanted to rip the fan’s head off. It took a bunch of security people to grab this guy by the horse collar of the shoulder pads and keep him from running into the stands. I mean, when was the last time we saw that? An NBA game, who was it that went into the stands after somebody? We made a parody of it. Yeah, a basketball player, it was the Pistons, Ron Artest. Ron Artest made a move, and they had to get — anyway, that was the NBA. That was years ago. The sportswriter community is terribly disturbed by the series of events, and then when you add what happened in the Seattle-Jacksonville game to the behavior at Steelers-Bengals and some of the other things happening in the league, there is a great fear that the league is losing control of the game as an enterprise. Not each individual game, but that the league is losing control and doesn’t quite know how to deal with players here who do not comport themselves in a business-like manner. And if they’re just now figuring that out, then they’ve got bigger problems than we even knew. You just don’t make a move on the fans. Yeah, fans throw things at you. Just keep walking. I mean, you are five feet from the tunnel. But here it came, “You don’t respect me. You don’t disrespect me.” That whole line of thinking creates more crime and more behavior that’s bad, this whole notion of not being dissed. So there will be some fines, and there will be some suspensions, and we’ll see what happens. But it appeared that fans again stayed away from stadiums. Did you hear what Fox had to do, Snerdley? One of the best games on the schedule yesterday was the Rams hosting the Philadelphia Eagles. They were both going to the playoffs. And it was a game against two of the best teams in the league. So Fox decided to take their pregame show to the coliseum and do it live, which would have been at 9 a.m. Pacific time. Well, the problem is kickoff wasn’t until 1:25, so the pregame show is four and a half hours before kickoff. And so Fox was concerned there wouldn’t be enough raucous, loud, screaming fans in the background to make it look like there was all kinds of excitement for the game. 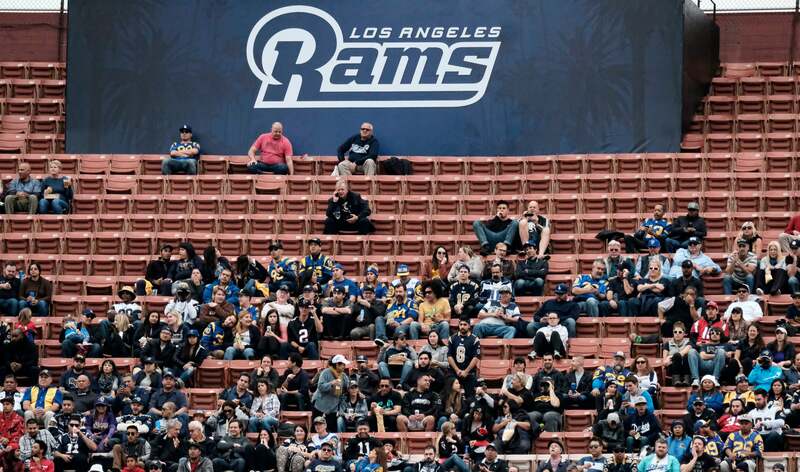 So Fox put out a casting call for actors to show up and pretend to be Rams fans. They said bring your Rams gear, bring jerseys, bring whatever and we’ll hire you, we’ll pay you, we’ll put there you so that you’re in the background so that people watching our show will think Rams fans can’t wait for the game. But they had to put out casting call for it. And it was great game. The Eagles, however, lost Carson Wentz, who was gonna win, may still, the MVP, rookie quarterback. He was just tearing it up and just an inadvertent football injury, Eagles confirmed it today that he has a torn ACL, which means he won’t play next year. It’s a year to rehab these things, on average. So this is a very, very unfortunate thing for the Eagles and their fans.